Rotting garbage smells bad to humans, but flies recognize that scent as a viable food source. If little white worms cover your garbage bags and garbage bin, chances are flies have found a way into garbage to feast on the rotting food and debris. Getting rid of white worms is a quick and easy process using household cleaning supplies. A close-up of food waste inside of a garbage bag. What are the White Worms? Those tiny white worms crawling through your garbage can are likely fly larvae, better known as maggots. Flies like the scent of rotting garbage and they will crawl through any crack or space in the garbage can to find the source of food. Once inside, flies eat garbage and lay eggs, which later hatch into larvae or maggots. Each fly lays hundreds of eggs resulting in thousands of maggots in a short time. Grubs, another type of white worm, are larger than maggots and tend to feed on decomposing wood and leaves rather than garbage. 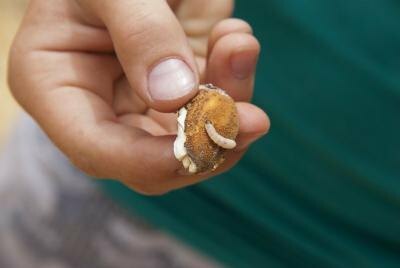 A boy holds a decomposing almond and a white worm. With a lot of hot water and some liquid dish detergent, white worms die off quickly. Remove all trash bags from the garbage can. It is best to wait until trash day to clean out cans, as white worms live inside bags as well. Boil a large pot of water and carefully pour steaming water into the garbage can. Add liquid dish detergent and agitate in the bottom of the can. Pour more hot water down the sides and over the top of the garbage can to remove white worms found there. Preparing food waste for disposal before throwing in the trash can is the best way to prevent white worms. 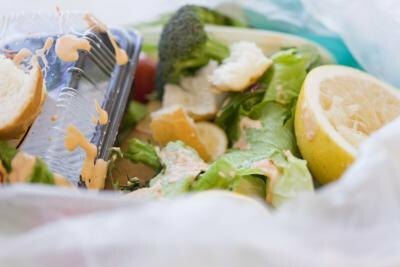 Place food waste in a smaller plastic bag and seal before throwing away. Line the bottom of your garbage can with cardboard to absorb liquid seeping from trash bags. 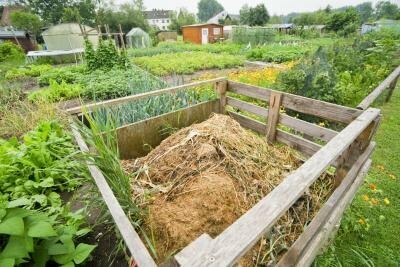 Compost food waste whenever possible to reduce the chance of rotting food. 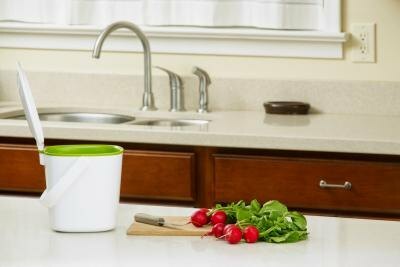 A compost container sits on the counter next to vegetables on a cutting board. White worms eat old food and decompose trash. When white worms are allows to live and grow within compost bins, they eat all types of food, including oily foods and dairy products, often thrown out as they are not considered viable for composting. Compost with white worms tends to smell less and does not require turning, as the white worms turn the food while eating. Cold weather kills white worms, so a new supply is needed each spring in areas with a cold winter climate. A composting bin outside in a garden.